Microsoft's Robbie Bach says touch-free technology of the Project Natal game system is the future of computers. 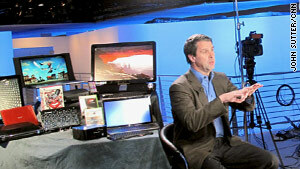 LAS VEGAS, Nevada (CNN) -- Robbie Bach is trying to change the way people interact with technology. Consider the status quo: To operate computers, most people peck away at keyboards and use a mouse to scoot a digital pointer across the screen. To make digital characters move in video games, we punch buttons with our thumbs or swing "nunchucks" around in the air, in the case of Nintendo's Wii. But what if technology just knew how the human body moved, how the human voice worked, and could react accordingly -- without people having to touch a gadget? That's what Bach, Microsoft's president for entertainment and devices, sees as the most exciting technological development on the horizon. In one form, it's almost here. At a keynote address at the massive Consumer Electronics Show, Bach announced that Microsoft's gesture-reading gaming system, called Project Natal, will be for sale by the next holiday season. Bach said Thursday that the Natal technology, which involved 20 years of research, may bleed from the gaming sector into phones and computers. The keyboard and mouse may not be dead yet. But they seem decidedly less cool next to gadgets that can read human movements and understand our spoken language. In an interview with CNN.com, Bach talked about tablet computers and his gaming habits and said it's a good thing that digital screens and computers are ending up everywhere, even in peoples' cars. CNN: You announced Project Natal [a gaming system that reads people's gestures and translates them to the screen without remote controls] will be up for sale this holiday season. What will it cost? Bach: The only thing we're discussing in terms of details is the close relationship we're working with publishers to develop titles for Natal. So, something like 75 to 80 percent of publishers in the world are already working on Natal titles, and that really is the key thing. CNN: What games will be released? Bach: We have another several months to bring them all forward. But I think people will recognize the names of all the companies that are working on these games. CNN: Do you think that technology -- the gesture-based interaction -- will bleed into other areas of technology, like computers? Bach: Yeah, I think it will. You've already seen touch [computers and phones with touch-sensitive screens], and gesture just takes that further. It takes you away from having to have something physical. Natal also involves voice, and you see that in other environments as well. So I think the whole idea of what we call a "natural user interface" is going to be a very big trend, not just in game consoles but in PCs, on phones and in other markets. CNN: Will that lead to the end of the mouse and keyboard? I think we're going to augment the tools people have. And, in some products, some games, you may only use Natal. But for some other things, you may want a controller, and that's fine. Bach: You mentioned "psychological games" last night. Is that a new category? Bach: It's a category we would call "psychological thriller." There's a game called "Alan Wake." And the whole idea behind "Alan Wake" is that it's sort of a blending of mystery and suspense. If you think of Alfred Hitchcock, and you think of those types of video and movie psychological thrillers, you bring that to a video game. And we look at that and say, "Wow, it's a new category. It's a new opportunity." CNN: Speaking of new categories, you showed off a few tablets last night [small computers with touch screens and, usually, no keyboard]. Is Microsoft going to come out with a tablet of its own? Bach: Certainly, what we showed last night was just the breadth and the power of the PC ecosystem. And you saw everything from those tablet devices all the way up to very high-end gaming machines. That really was the message last night: The PC ecosystem is alive and well. There's tons of innovation, and you're going to see more of that. The tablet category is a new category, and we think it's going to be important. CNN: Do you think it's hyped? Bach: Well, there's obviously hype. Everybody's talking about things that haven't been announced yet [Apple is rumored to be unveiling a tablet later this month], so that automatically gets you into that category. So I think once all the products start to come to market, people will start to see how the applications work and how people are using them, and then the category will develop from there. CNN: It seems like digital screens are ending up everywhere. They're in cars, they're on phones, they're in the living room. Is there a downside to that? Can it go too far? Bach: I don't know about it going too far. Obviously, there's environments in which you have to use the screen appropriately. In a car, you don't want a video playing on the front screen of the dash while somebody's trying to drive. So there's common-sense things that we have to work on and make sure work well. That's part of the reason that natural interfaces are better than physical interfaces in some environments, like the car. But in general, we've had screens in our lives all the time: They've just been analog screens, whether they were books or they were paintings or photos or whatever it is. All of that content is going digital, and screens are going to be the way that content is presented going forward. And I think it's actually a good trend. CNN: There are safety experts who would say in-car touch-screens are too tempting or distracting for drivers. Do you think there's anything to that argument? The coolest technology is the stuff we're working on with Natal. It changes the way people think about things. Bach: When we work with our car partners, like Ford and Kia and Fiat, certainly what they focus on is safety. And that's why voice recognition is such an important part of our system. That's why the systems use controls on the wheel. It's actually a very clear focus for the auto manufacturers. They're quite aware that safety must come first. CNN: Do you use the technology that you promote? Are you a gamer? Bach: I'm what you would call a casual gamer. My son is a very serious gamer. My daughters are "Rock Band" and "Guitar Hero"-type gamers. I use it some. But I'm a little bit more on the music and video side, so I'm a Zune HD user. I use different parts of the technology just like everybody else. I'm a big user of Netflix on Xbox Live. I actually think that's quite cool. CNN: What's the most embarrassing thing on your Zune? Bach: The most embarrassing thing on my Zune! That's an interesting question. I don't know if it's embarrassing, but I'm a big Amy Grant fan. So that's a historical anomaly maybe, but I think she's got a great voice. CNN: I'm going to ask a few questions our readers had. A few wanted me to ask about Windows phones. Will one be coming out? And what's the future of Microsoft in the mobile space? Bach: Well, certainly we think there's a bright future in the Windows phone space. ... You're going to see more news from us at the Mobile World Congress [an event in February], where we'll talk about enhancements and new technology in the Windows phone space. We think it's an important market and a place where we're going to play quite heavily. Bach: The power outage was [because] the HVAC system at the Hilton failed. And it knocked out the power to the hotel. So that knocked out the power to the stage, which meant we took some time to have to reset. CNN: Do you have any details on the HP slate? Bach: No, it's an HP product. It's a great product. We're excited about the category; we think it's an interesting category. It's part of the broader PC ecosystem. I'll leave it to HP to tell you all the specific details. CNN: There are some people who attended the keynote last night who left feeling disappointed. They thought maybe there would be a bigger announcement or more new products. How do you respond? Bach: I think we announced a lot of cool stuff last night. ... I thought it was a very rich keynote. Expectations are always a hard thing to manage. CNN: What's the coolest technology out on the horizon right now? Bach: For me, the coolest technology is the stuff we're working on with Natal. It changes the way people think about things. When you can walk up to a device and just naturally be yourself and have the right things happen, that changes everything. ... Also, on a technical level, it's some of the most advanced work we're doing. It's literally 20 years of research, over 1,000 patents. CNN: You mentioned Natal will work with Xbox 360. What new parts would a person need to buy to make the system work? Bach: It's basically a camera. So there's a device you'll have to buy. And then there will be games.